Steve Hoefer still has all his fingers. Our bodies are pretty robust, but they can seem downright fragile when they go up against a slipping power tool, a flying piece of metal, or toxic fumes. If everything went right all of the time, no one would need safety equipment. But nothing goes right all of the time, and for those times it's better to be safe than bleeding. Nobody likes safety equipment. It's sometimes uncomfortable and can limit what you can do. It's another expense and something else to maintain. But all of those things are better than a trip to the ER. Or morgue. Avoid anything that can get caught in power tools. Remove loose clothing and jewelry. Long hair should be tied back or covered. Have a well lit work area. Keep your tools in good repair. Make sure your cutting edges are sharp and all the manufacturer's safety features are in place. Keep your workspace clean. Well, okay. No one's workspace is clean. But avoid creating obstacles, piles of debris, and other things that can snag, trip, or slip. Have good ventilation and a flow of fresh air. Understand the dangers of your tools. This is usually covered in the operation manual. Yes, it reads like lawyer-fueled overkill, but behind those words was a serious, preventable injury. Eyeballs are either expensive or impossible to repair, so it's worth a couple dollars to protect them. 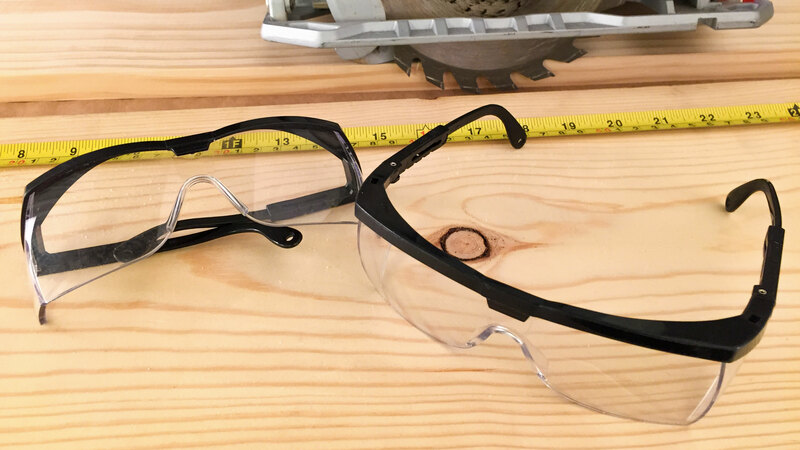 Safety glasses are really all you need for most projects, they offer good protection from flying debris and light to moderate dust. Wear them when there's any chance that something unpleasant could hit you in the eye. Even a tiny grinding disk on a low power rotary tool can shatter and send shards on a high-velocity mission to cause harm. (Ask me how I know.) Your blink reflex is not nearly fast enough to protect you. They're cheap enough to buy in bulk and it's not unheard of to keep a pair near every power tool and on every workbench. It can be worth spending the extra dollar to get a model with adjustable temples and a soft bridge, since you're more likely to wear them when they fit well. Don't mistake your prescription eyeglasses for safety glasses. Safety glasses cover more of the face, have side shields, and are made of impact resistant materials. They're also much cheaper to replace when you get a sliver of steel stuck in them. If you do wear prescription glasses, there are safety glasses that are made to fit over them. Pretty much all the time. Power tools can throw debris, spinning tools can shatter, solder and paint can splatter, hammers can throw splinters, blades can break, etc. There's a maxim that says "If your boogers change color you should have used a respirator." By then, of course, it's too late. And boogers don't show things that can invisibly damage your respiration. There are lots of things that you can't see that your lungs will not enjoy. 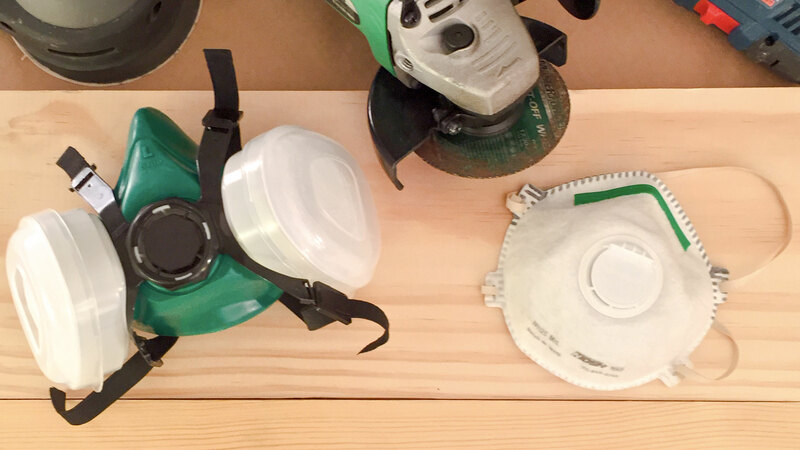 Disposable surgical-style dust masks are good for most home projects. To work properly they need to fit tightly against the face. If you inhale and can feel a draft around the mask, use your hands to mold it into a better fit. Discard them after using them once. Earlier of they show discoloration or start to smell funky. Half-face respirators with swappable filters are more expensive, but also offer better protection and filters can be changed for different tasks. They also come in different sizes which fit the face better. They're generally popular if you're working for extended periods around aerosols, spray paint, or fine dust. In the US respirators are rated 95, 99, or 100, indicating the amount of airborne particles they remove. (100 is rounded up from 99.97%.) They have a prefix letter: N for not oil resistant, R for oil resistant and P for oil proof. For most workshop tasks a N95 is good enough. If you have trouble finding a rating on a mask or filter, it almost certainly doesn't measure up and should be avoided. People with beards or enthusiastic mustaches need to invest in a hood or helmet respirator since it's impossible for them to get a good seal on the face. Good ventilation is no substitute for a respirator -- particularly since you're usually working within arm's reach of the source of the trouble. But ventilation will make your respirator more effective because it will have less work to do. Whenever there's anything other than air in the air. 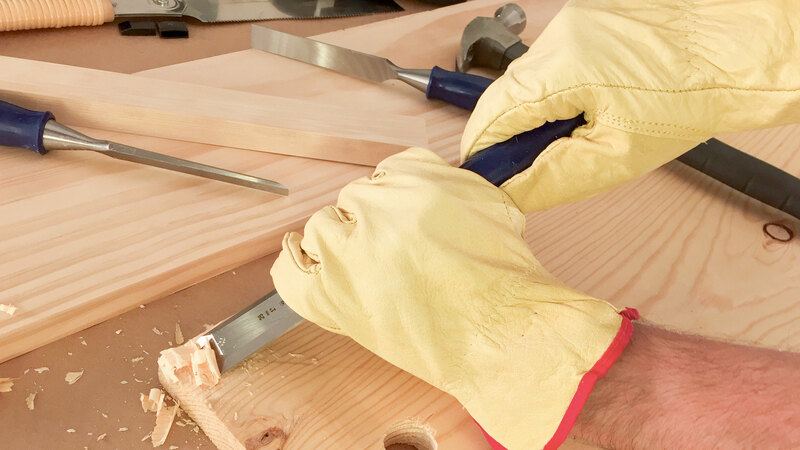 Hands usually take the brunt of wear and tear with working with tools. They have the front-row seat to the action. Gloves are the best way to protect them from cuts, splitters, stains, and jabs. However they shouldn't be worn when using power tools. If they get caught in the mechanism they can quickly turn a glove into a bag of mangled fingers. A good glove fits as closely as possible without restricting movement or circulation. A poor fitting glove can be more hazard than help. A glove that's too small will restrict your movement and one too large will make you ham-handed and more likely to catch it on something. Consider all gloves as disposable. They're made to take the damage so your hands don't have to. Eventually they'll get cut, stained, burned, or otherwise abused to the point where they can't protect well. Once they've started to show wear, replace them. Latex, nitrile, or rubber glove protect from things that can stain or irritate your skin, like paints, stains, and most other household chemicals. Latex can dissolve in oil and grease, while nitrile will dissolve in many solvents, so choose the type of glove to match what you're working with. Latex and nitrile offer excellent dexterity, though some people are allergic to latex. "Rubber" (neoprene or PVC) gloves offer better protection and durability but at a cost of dexterity. They all come in a variety of sizes. Lightweight cloth gloves offer protection from basic hazards like dirt, splinters, and sharp edges. They're good for hand woodworking, gardening, etc. Look for gloves with elastic fabric for better fit. Other popular features include kevlar reinforcement for cut protection, and rubber-impregnated palms for better grip. Leather gloves offer more protection and heat resistance, but at a cost to dexterity and sensitivity. They're good for working with barbed/razor wire, metal, and where you're likely to bark your knuckles with hand tools. When you don't want to spend the afternoon scrubbing of stains, salving burns, picking out splinters, or tending scrapes and cuts. 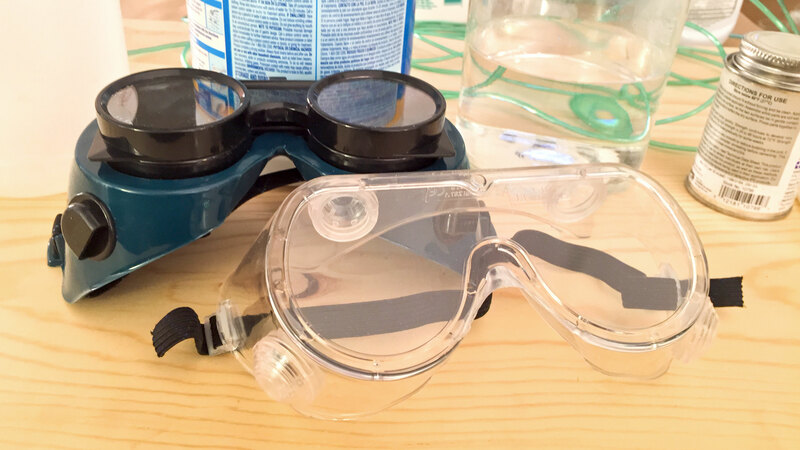 Goggles are more comprehensive -- and correspondingly less comfortable -- than safety glasses. The offer improved protection from goggles, sealing against the skin to protect from mists, splashes, gasses, and intense dust. While glasses tend to be one-size-fits-all, goggles come in a few different sizes. Softer rubber helps make a better seal against the face and anti-fog lenses will help keep your vision clear. Tighten the headband enough to keep them from slipping down your face, but not any tighter or they'll quickly become uncomfortable. An important difference in goggles is the venting style. Direct vents are the cheapest and most common, allowing direct air circulation inside. This also means that whatever is in the air can get inside. Indirectly Vented goggles protect against splashes by hooding the vent so that anything that hits it won't get inside. Unvented provide the most safety, no fumes or splashes can get inside. But they tend to be the least comfortable. Goggles are often given to kids because they're sciencey, but they tend to be particularly uncomfortable for little heads, giving kids the impression that all safety equipment is similarly unpleasant. If working with young ones see if safety glasses will provide the protection you need. When you need more protection that safety glasses. When working with toxic or caustic liquids and aerosols, or in environments with pervasive fine dust. Like vision, once your hearing is damaged, you're typically stuck with it. Health officials say you should try to limit the noise coming into your ears to less than 85 decibels for any extended time. High power tools like circular saws and routers easily put out 100 dB or more. (Since the decibel scale is logarithmic, 100dB is more than 200 times as loud as 85dB.) 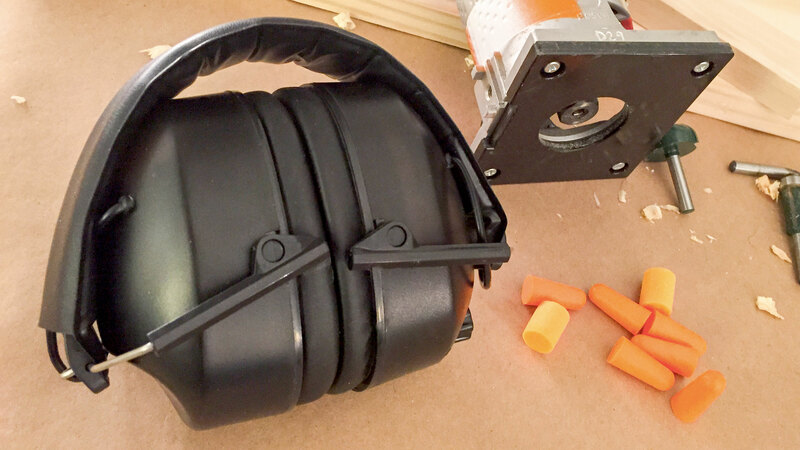 Hearing protection is rated by the number of decibels they reduce. Since you probably don't have a calibrated sound level meter, here's a good rule of thumb: If you have to shout to be understood, you should be wearing hearing protection. Earplugs are the cheapest solution. They're slow-expanding foam or soft rubber inserts you push into your ear, usually brightly colored so other people can tell you're wearing them (and not ignoring them.) Foam earplugs are made from slow-expanding foam that you compress before sticking them in your ear. The rubber ones have soft baffles to expand gently into your ear canal. Both kinds are disposable and can be bought in pairs or in bulk. Check the label for how much hearing protection they offer. They typically range from 20-35db and should be thrown out after each use. Again, if you can't find a decibel rating, buy a different pair. Earmuffs are more versatile and non-disposable, though more expensive in the short-term. They cover your entire ear and need to fit well in order to work. If possible try them on before buying, because some models tend to clamp your head in order to make a good seal. Since they seal tight around the ear they can also make your ears sweaty, so find a pair that you're comfortable with. 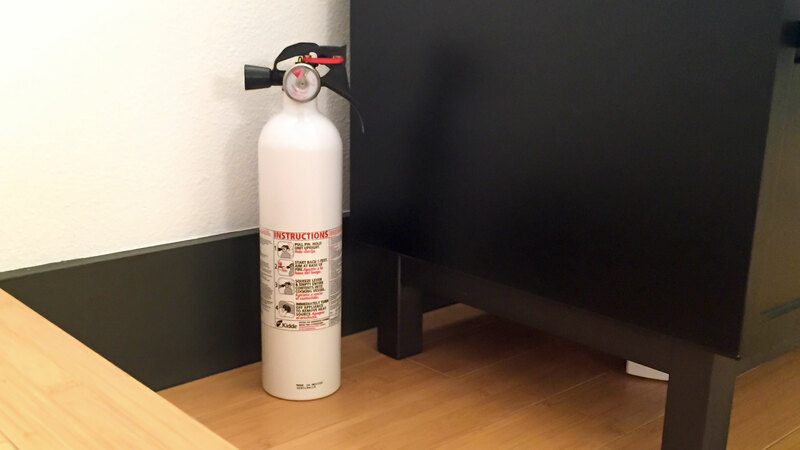 Even if you're not playing with fire it's good to keep a fire extinguisher around. Tools get hot, sparks get thrown, and dust or vapor clouds can lurk. A: Common trash. Paper, wood, and most plastics. B: Combustible liquids like gas, grease, and oil. Using a Class A extinguisher on a Class B fire can be disastrous, so get a comprehensive ABC model. That way you won't have to think more than necessary when things are on fire. Most extinguishers also have a number associated with them, the bigger the number the larger fire it can put out. But more power makes them bigger and heavier. Make sure you can easily lift and operate the one you have. To effectively use a fire extinguisher, pull the pin, aim the nozzle at the base of the flames (not the flames themselves) and pull the trigger, sweeping across the burning area. After a first pass, let the spray settle for a bit, then go back to douse anything still burning. Keep an eye on the area afterwards to catch flareups. And if the fire is out of control or generating more than a little smoke, clear out and call in the professionals. To keep the house from burning down. Safety equipment won't protect you from everything. For those times when things go wrong in ways that your safety equipment can't fully handle, it's important to have a first aid kit. 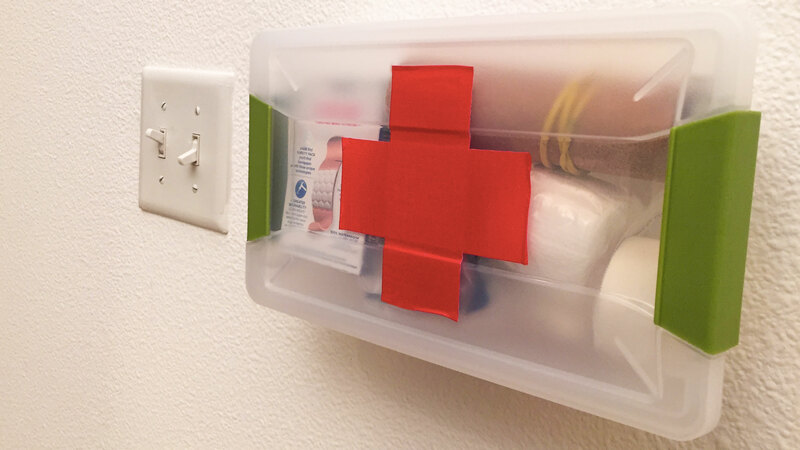 First aid kits designed for workshops are pretty common, but you can easily assemble your own. Fill it with things to treat the kinds of injuries likely to happen when working with tools: All sizes of bandages and gauze, tweezers for splinter removal, an eye cup for flushing debris out of eyeballs. Sterilizing wipes and antibiotic creme. Latex (or nitrile) gloves so you can touch things without having to wash your hands. A zip-lock bag and an instant cold-pack for temporarily detached digits might sound like an extreme addition, until you need it. Put it all in a dust-proof box, label it clearly, and make it easy to find. Take the time to learn basic first aid so you know how to dress wounds without freaking out, or having to search a how-to manual while blood is flowing. The Red Cross has a lot of useful information and classes on basic first aid. To keep your blood off the floor.